A.1 What does "CANDU" mean? A.2 How does a CANDU reactor work?? A.3 What is "nuclear fission"? A.4 Where does the first neutron come from in a fission chain reaction? A.5 What is "heavy water"? A.6 How does a CANDU reactor refuel on-power? A.7 How is fission energy converted to electrical energy in CANDU plants? A.8 How many different CANDU designs are there? A.9 How do CANDU reactors rank in performance against other designs? A.10 How do CANDU reactors achieve high neutron economy? A.11 What fuel cycles can CANDU reactors adapt to? A.12 What is CANFLEX fuel? 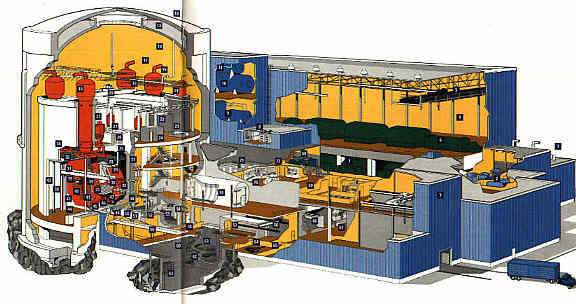 A.13 What is the "Advanced CANDU Reactor" (ACR)? A.14 What is the "Enhanced CANDU-6 Reactor" (EC6)? A.15 How are CANDU reactors controlled? A.16 How is core refurbishment part of CANDU life management? A.17 Can CANDU reactors perform load following? CANDU (a registered trademark of Atomic Energy of Canada Ltd.) stands for "Canada Deuterium Uranium". It is a pressurized heavy-water power reactor designed first in the late 1950s by a consortium of Canadian government and private industry. All power reactors in Canada are of the CANDU type (of varying vintage). It is also the power-reactor product marketed by Canada abroad. The original CANDU designer is AECL (Atomic Energy of Canada Limited), a federal crown corporation created in 1952. Over 150 private companies in Canada supply components for the CANDU system (see related FAQ). As of October 1, 2011, responsibility for all commercial CANDU design, maintenance services, and marketing became was transferred to Mississauga, Ontario-based Candu Energy Inc. (a wholly ownded subsidiary of Montreal-based engineering firm SNC Lavalin), which purchased these rights from AECL. A.2 How does a CANDU reactor work? The main difference between all the thermal stations is the source of heat. In fossil-fuelled stations the heat is generated by burning coal, oil, or natural gas. In a nuclear station the heat is generated by the nuclear fission of uranium (see related FAQ). As a source of industrial heat, nuclear fission has several advantages over fossil fuel burning (see related FAQs), but many of them stem from the fundamental fission process itself, which extracts millions of times more energy from a kg of fuel than any chemical reaction could (such as burning fossil fuels). Primarily, the CANDU reactor is a heavy water moderated reactor (see related FAQ). Heavy water is the key to many of the unique features of the CANDU design, including its ability to run on a variety of fuel types and many of its inherent safety features. The CANDU design can use either natural uranium or enriched uranium fuel, and either heavy water (D2O) or regular (or "light") water (H2O) as coolant (the moderator and coolant are separate systems). It is refuelled at full-power, a capability provided by the subdivision of the core into hundreds of separate pressure tubes. 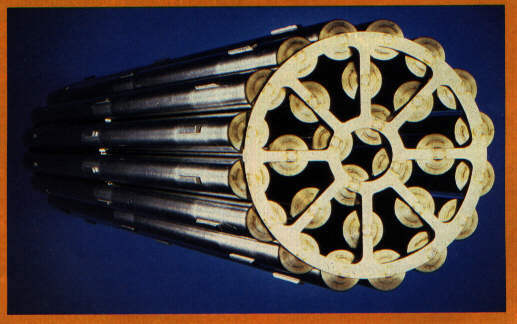 Each pressure tube holds a single string of natural uranium fuel bundles (each bundle half a metre long and weighing about 20 kg) immersed in heavy-water coolant, and can be thought of as one of many separate "mini-pressure-vessel reactors" - highly subcritical of course. Surrounding each pressure tube a low-pressure, low-temperature heavy-water moderator fills the space between neighbouring pressure tubes. The cylindrical tank containing the pressure tubes and moderator, called the "calandria", sits on its side. Thus, the CANDU core is horizontal. A fuelling machine visits each end of the core, one fuelling and the other de-fuelling, allowing operators to insert fresh fuel at alternate ends for neighbouring fuel channels. From six to ten bundles are "shuffled" each day. Thermalhydraulically, the core of most CANDU reactors is divided into two halves, with the divider line running vertically down the centre of the reactor face. Each half represents a separate coolant circuit. Heavy water coolant is supplied to the pressure tubes in each circuit via large headers at each end of the calandria, one pair of headers (inlet/outlet) for each half of the core. The subdivision of the core into two circuits, plus the fine subdivision into hundreds of interconnected pressure tubes, greatly reduces the effect of a potential LOCA (Loss-of-Coolant Accident). See related FAQ for more discussion of CANDU safety. Robertson, J.A.L., "The Basics of Nuclear Energy", Atomic Energy of Canada Ltd. public brochure, 1982. "Nuclear Definitions", Ontario Power Generation (Ontario Hydro) public brochure, 1981. Nuclear fission occurs when the nucleus of an atom splits into two or more pieces. This seemingly simple concept is actually quite a complex phenomenon that lay undiscovered for the first forty years of nuclear science. When eventually discovered at the outset of World War II, nuclear fission was immediately recognized as one of the most revolutionary, and (simultaneously) most potentially beneficial and destructive advances in the history of human development. All matter is constructed from many billions of tiny atoms that are too small to be seen, even with an electron microscope: the tip of your index finger alone contains over 100 billion trillion atoms (that's a "1" followed by 23 zeroes). Atoms, in turn, consist of a central positively-charged "nucleus", surrounded by a cloud of negatively-charged orbiting electrons. The nucleus is very dense and contains most of the mass of any atom, and in fact it can be said that each atom (and thus matter itself) is mostly empty space. For example, if you could magnify the nucleus of a uranium atom to the size of a basketball, the corresponding distance to the neighbouring uranium nucleus would be about 6 km! The vast region in between would essentially have near-zero density (or near-vacuum conditions), and would carry a net negative charge. The nucleus, in turn, is constructed of even smaller particles called "nucleons", which come in two main varieties: protons and neutrons. These two particles have roughly the same mass; however protons carry a positive charge and neutrons carry no net charge ("neutral"). A uranium nucleus contains over 230 protons and neutrons, which in the basketball analogy would each be about the size of a ping-pong ball. Neutrons, as free particles outside of a nucleus, turn out to be quite useful tools for scientific research. Until their discovery in 1932, scientists had only positively-charged particles (e.g. protons, alpha particles) at their disposal for bombarding atoms and seeing what happened next. This required a great deal of energy since both the "bullet" particles and their "target" nuclei were positively charged, and nature doesn't let similar electrical charges get too close to each other (analogous to what happens when you try to push the similar poles of two magnets together). With the discovery of the neutron, however, scientists now had a particle that carried none of this electrical "baggage" - one that could enter a positively-charged nucleus at will, even with next to no energy. For years after the discovery of the neutron, this is exactly what many scientists around the world did. They believed that one of two possible things happened when a neutron entered a nucleus: it either bounced out again (usually in a different direction and often slowing down in the process), or it became absorbed by the nucleus and stopped. Both processes yield useful information and are still employed today in industry and science; for example, neutron absorption is used to make life-saving medical radioisotopes (see related FAQ), and neutron bouncing (or "scattering") is used to improve the performance and safety of materials (see related FAQ). If the nucleus absorbs a neutron it becomes heavier, by approximately the mass of a neutron, and this usually makes it unstable. Nature's way of dealing with nuclear instabilities is to squeeze energy out of it until stability is achieved, and this process of emitting energy from the nucleus is called "radioactivity", or "radioactive decay". With their new "neutron" tool, therefore, scientists could make hundreds of new, generally radioactive species of atoms, and the world of nuclear science in the pre-WWII years was exciting indeed. What happened next, however, was nothing short of revolutionary. When scientists bombarded uranium with neutrons, in addition to making heavier atoms (which in itself was exciting since uranium was, until then, the heaviest atom found on earth), they realized - eventually - that they had caused some uranium atoms to split in half. They could tell this because when they examined the reaction products, the chemical signatures looked strangely similar to that belonging to atoms about half the size of uranium. The term "fission" was borrowed from the world of biology to describe this, and the rest is history. In simple terms, nuclear fission occurs because large nuclei, like that of uranium, are about as big as nature can handle, so one more nucleon essentially becomes the straw that breaks the nuclear camel's back. This happens because any nucleus is held together by a tug of war between two powerful forces: one tending to glue it together and one tending to pull it apart. It so happens that the "glue" force (known as the "strong nuclear force") tends to get weaker as the diameter of a nucleus gets bigger, while the "pull apart" force (technically, the electrostatic repulsion from all the positively-charged protons in the nucleus) loses relatively little strength with distance. As nuclei get bigger and bigger, therefore, a point is reached where the "glue" force can no longer hold the nucleons to each other, and the atoms at this limiting size would therefore be the largest found in nature. The element whose atoms meet this description is uranium: when uranium gets one neutron heavier it doesn't just want to shed energy by releasing radioactivity; it gains so much energy (or instability) that it wants to break into pieces — or fission. A nucleus of uranium has 92 protons, each wanting to get as far away from the others as possible. This is about as big a nucleus as the "glue" force can handle, and even then it's still a little bit too big, since uranium itself is a mildly unstable element (it radioactively decays, albeit at a very slow rate measured in the billions of years). Now, uranium comes in two versions: a smaller variety with 235 total nucleons (U-235), which means 92 protons and 143 neutrons; and a larger variety with 238 total nucleons (U-238), meaning 92 protons and 146 neutrons. Nuclei of any given element that differ this way in the number of neutrons are called "isotopes". It just so happens that although the smaller uranium isotope, U-235, is relatively sparsely distributed (less than 1% of all uranium on earth), it accounts for most of the fissions in a nuclear reactor. This is due to the relatively high probability of fission occuring in U-235 in the first place, particularly for neutrons of slower speeds (as described below). Which brings us to the question - what does nuclear fission have to do with making electricity? The answer lies in the fact that since fissioning a uranium nucleus is a way for nature to relieve a certain amount of "stress" involved in holding it together, it follows that some energy would be released in the process. It turns out that a lot of energy is released, several hundred million times more than the average chemical reaction. A certain amount of mass is lost in the process, which is converted to this energy according to Einstein's famous equation, E=mc2. What's more interesting is that a few other things are emitted when a uranium atom fissions, including two or three more neutrons. Since these are the same particles that cause a uranium nucleus to fission in the first place, the possibility exists to set up a "chain reaction" whereby uranium nuclei fission through collisions with neutrons, release a large amount of energy, and emit more neutrons that cause fissions in other uranium nuclei, and so on, and so on. 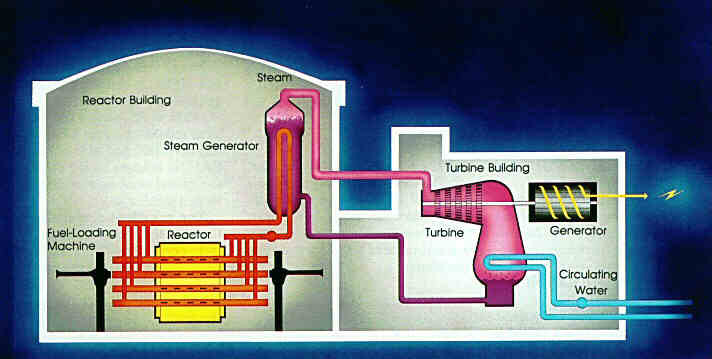 The energy shows up mostly as heat that can be put to useful work, and this is how a nuclear power reactor works. A fraction of the fission energy shows up as high-frequency electromagnetic waves, called "gamma" radiation. Radiation of all various types, including gamma, is also emitted by the two remaining pieces of the uranium (the "fission products"), and hence nuclear reactors, and the fuel they discharge, must be shielded and properly handled. The only remaining problem is that the neutrons emitted in each fission event are traveling far too fast (about 10% the speed of light) to initiate a significant number of new fission events. Since the chances of a uranium atom "catching" a neutron increases as the neutron speed decreases (for the same reason that it's easier to catch a lobbed softball than a 95 mph fastball), the neutrons must be slowed down. In a typical power reactor the neutrons are "slowed down" to a couple of km per second. 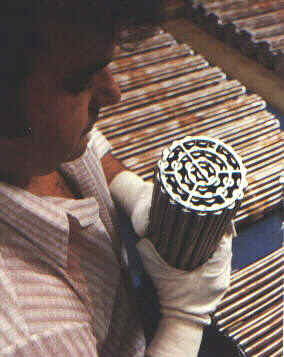 This process is called "moderating" the neutrons, and the material used for this purpose is called a "moderator". Moderating neutrons is actually quite simple: when neutrons bounce (or "scatter") off other nuclei, they tend to lose energy in the process, similar to how a billiard ball slows as it bounces around a billiard table. One of the best materials for this moderating process is ordinary water, since the hydrogen nuclei in water is similar in size to a neutron - and collisions with similar-sized objects can result in high energy loss per collision. This is how most of the world's power reactors slow, or moderate, their neutrons (another word for "regular" water is "light" water, and these reactors are classified broadly as "light water reactors", or LWRs). NOTE: The above article provides a brief overview of the nuclear physics necessary to understand nuclear fission. For a more general introduction to the amazing world of "inner space", visit Lawrence Berkeley National Lab's excellent ABCs of Nuclear Science and Particle Adventure, which summarize the physics of radioactive decay and subatomic particle theory. For an excellent overview of nuclear and other areas of physics governing our natural world (including some great science fair ideas), visit Georgia State University's "HyperPhysics" website. To initiate the very first fission chain reaction in a nuclear reactor, there has to be a "first neutron". The first neutron can come from a neutron source (e.g. Cf-252) or from the uranium fuel itself. Due to the spontaneous fission of uranium nuclei, every kilogram of uranium emits on average about 14 neutrons per second. A CANDU core will contain roughly a hundred tonnes of uranium, and therefore over a million neutrons per second will be generated in the core even without any sustained chain reaction. This is enough of a neutron population to kickstart the fission process, and thus the process of starting the reactor involves simply removing absorber material (either mechanically or chemically) until neutron multiplication through fission builds to the desired level. A smaller research reactor may not have tonnes of uranium in its core (often only a few tens of kilograms or less), and therefore spontaneous fission neutrons would be produced at too low a rate to be useful in starting up the reactor. These are the cases when an externally-supplied source of neutrons would be used. Once a reactor has operated for a significant length of time, there will typically be a much higher spontaneous neutron rate in the core due to the presence of neutron-emitting fission products. Additionally, in a heavy-water reactor core (like CANDU) the heavy water becomes a significant neutron source when it is exposed to gamma radiation, since gamma photons can have enough energy to kick neutrons out of the heavy hydrogen nucleus. This "photoneutron" source in heavy-water reactors also becomes important once a significant population of gamma-emitting fission products builds up in the core. Heavy Water is the common name for D2O, deuterium oxide, and is one of the key materials used in a CANDU reacor. Heavy water is similar to light water (H2O) in many ways, except that the hydrogen atom in each water molecule is replaced by "heavy" hydrogen, or deuterium (discovered by American chemist Harold Urey in 1931, earning him the 1934 Nobel Prize in chemistry). The deuterium makes D2O about 10% heavier than ordinary water. Deuterium is a stable but rare isotope of hydrogen containing one neutron and one proton in its nucleus (common hydrogen has only a proton). Chemically, this additional neutron changes things only slightly, but in nuclear terms the difference is significant. For instance, heavy water is about eight times less efficient than light water for slowing down ("moderating") neutrons, but its macroscopic absorption cross-section (i.e. probability of absorption) is over 600 times less, leading to a moderating ratio (the ratio of the two parameters, a useful measure of a moderator's quality) that is 80 times higher than that of light water. Heavy water's low absorption cross-section permits the use of natural uranium, which is low in fissile content and would not attain criticality in a light-water lattice. The lower slowing-down power of heavy water requires a much larger lattice than in light-water cores; however, the larger lattice allows space at the core endfaces for on-line refuelling, as well as space between channels for control rods, in-core detectors, and other non-fuel components. CANDU reactor cores therefore tend to be larger than light-water reactor cores, with a much larger water inventory - leading to other advantages in terms of safety under extreme accident conditions. Heavy water was one of the first moderator materials investigated by scientists investigating nuclear fission; primarily in France at first but moving to Britain and then Canada during World War II (see related FAQ - eventually becoming the basis of all of Canada's large research reactorsa and power reactors. In the past all of the heavy water for Canada's domestic and export needs has been extracted from ordinary water, where deuterium occurs naturally at a concentration of about 150 ppm (deuterium-to-hydrogen). For bulk commercial production, the primary extraction process to date, the "Girdler-Sulphide (G-S)" process, exploits the temperature-dependence of the exchange of deuterium between water and hydrogen-sulphide gas (H2S). In a typical G-S heavy-water extraction tower, ordinary water is passed over perforated trays through which the gas is bubbled. In the "hot section" of each tower the deuterium will migrate to the hydrogen-sulphide gas, and in the "cold section" this deuterium migrates back into cold feedwater. In a multistage process, the water is passed through several extraction towers in series, ending with a vacuum distillation process that completes the enrichment to "reactor-grade" heavy water, nominally 99.75 wt% deuterium content. A CANDU reactor requires, in total, between 460 and 592 metric tonnes (1 tonne = 1000 kg) of heavy water, a little more than half of this in the moderator and the rest in the pressurized coolant (for example, a CANDU 6 reactor uses 265 metric tonnes in its moderator and 192 metric tonnes in its coolant). During operation a CANDU plant will be required to periodically upgrade its inventory of heavy water (using again a vacuum distillation process), since a purity decrease of only 0.1 wt% can seriously affect the efficiency of the reactor's fuel utilization. Typically a CANDU reactor also requires replacement of about 3 metric tonnes of heavy water per year due to routine losses. The G-S process, while capable of supplying the massive CANDU build programme from the late 1960s to the late 1980s, is expensive and requires large quantities of toxic H2S gas. It is thus a poor match for current market and regulatory conditions, and the last G-S plant in Canada shut down in 1997. Canadian Nuclear Laboratories has developed more efficient heavy-water production processes based on wet-proofed catalyst technology. CECE and CIRCE are based on electrolytic hydrogen and reformed hydrogen, respectively. CIRCE could be on the sidestream of a fertilizer or hydrogen-production plant, for example. For a time A prototype CIRCE unit operated at a small hydrogen-production plant in Hamilton, Ontario. These catalyst technologies are more environmentally benign than the gas-extraction process they would replace. See "further reading" below for more details on the past and future of heavy-water production in Canada. This process of "enriching" the moderator, rather than the fuel, is expensive and is part of the reason for the slightly larger capital cost of CANDU reactors compared to light-water reactors (heavy water represents about 20% of the capital cost). However, since the fuelling cost of a CANDU reactor is much lower than that of light-water, enriched-uranium reactors, the lifetime-averaged costs are comparable. Nevertheless, future CANDU designs will use about a quarter the heavy-water inventory for the same power output (see related FAQ), thus making their capital (up-front) cost more competitive. Heavy water has an alternate attraction for scientists studying the elusive neutrino particle. In Canada's Sudbury Neutrino Observatory (SNO) Project, about 1000 tonnes of heavy water, on loan from AECL, were used as an interaction medium in which to track the passage of neutrinos from the sun. The heavy water is held in a large acrylic container two kilometres deep in the Canadian Shield, surrounded by photomultiplier detectors. This work led to a Nobel Prize in Physics for Dr. Art McDonald of Queens University (Kingstonm, Ontario), in 2015. "Heavy Water: a Manufacturers' Guide for the Hydrogen Century" - The past and future of heavy-water technology in Canada, by heavy-water expert Dr. Alistair I. Miller of Atomic Energy of Canada Ltd. (PDF format, 340 kb). 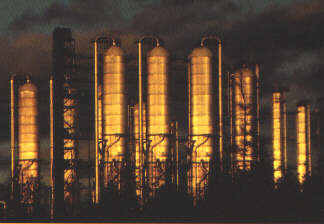 Prototype CIRCE plant in Hamilton, Ontario. On-power refuelling is one of the unique features of the CANDU system. Due to the low excess reactivity of a natural-uranium fuel cycle, the core is designed to be continuously "stoked" with new fuel, rather than completely changed in a batch process (as in LWRs and BWRs). This reduces core excess reactivity, and the requirement for burnable poisons, which in turn increases fuel burnup (i.e., decreases the fuel throughput rate). Other advantages of on-power refuelling include increased capacity factors (availability of the reactor), the ability to "fine-tune" the power distribution, the ability to detect and remove defective fuel, and a minimization of power perturbations due to refuelling. On-power refuelling is achieved with two identical fuelling machines that latch on to opposing ends of a designated channel. Each machine, operated remotely from the control room, includes a magazine capable of either discharging new fuel or accepting spent fuel. With both machines latched on and brought up to system pressure, the ends of the fuel channel are opened up and new fuel is exchanged for old fuel - one machine discharging and the other accepting. The direction of fuelling is alternated in neighbouring channels to reduce asymmetries in the axial flux. Both machines then disengage from the fuel channel, and the machine containing spent fuel travels to the discharge room, where it transfers its load to the spent fuel storage facility. A channel is chosen for refuelling based upon several criteria, derived from both core-tracking simulation software and actual core instrumentation. The primary criterion is high burnup, but attention is also paid to minimization of the refuelling power "ripple", prevention of "hot spots", symmetry across the core, refuelling at alternate ends of the core, removal of experimental or defective bundles, maintaining an equal number of refuelled channels per zone, minimization of zone control level disparity, and striving for a uniform channel visit rate per week. In the CANDU design, as with the PWR design, the heat of fission is transferred, via a primary water coolant, to a secondary water system. The two water systems "meet" in a bank of steam generators, where the heat from the first system causes the second system (at lower pressure) to boil. This steam is then dried (liquid droplets removed, since they can damage turbine blades) and passed to a series of high-pressure and low-pressure steam turbines. The turbines are connected in series to an electrical generator. The primary water system, which becomes radioactive over time, does not leave the reactor's containment building. It is a highly complex system from start to finish, involving a series of energy transformations with associated efficiencies. The potential energy of nuclear structure is converted first to heat via the fission process, then steam pressure, kinetic energy (of the turbine and generator), and ultimately to electrical energy. The steam generators in CANDU plants differ from those in PWR plants, because their primary water system is different; besides the material itself (heavy water vs. light water), this applies to the chemistry, pressure, and temperature. 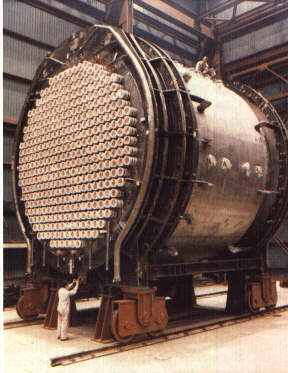 CANDU steam generators were developed with aid from engineering companies in the United States, but on an independent track as dictated by the unique requirements of the CANDU process system. The late John M. Dyke was a retired engineer who was intimately involved with the early design selection and development of CANDU steam generators. He wrote a short memoir, available here, recalling the interesting twists and turns that characterized this pioneering effort. Most CANDU steam generators are U-bend tube-in-shell designs, with both an integral pre-heater section and an integral dryer centrifuge on top. This leads them to have a characteristic "light-bulb" shape. All CANDU reactors follow the same basic design, although variations can be found in most units. Power output in currently-operating units ranges from 125 MWe up to over 900 MWe, the main determinant being the number of fuel channels in the core. Ontario Power Generation (formerly Ontario Hydro) and Bruce Power units (all in the province of Ontario) tend to share a single containment system in a multi-unit station, while the commercial units sold to other Canadian utilities, as well as abroad, tend to have stand-alone containment like that found in other nuclear plant designs. All of the CANDU units sold abroad by Atomic Energy of Canada Ltd. (AECL), with the exception of the early units sold to India and Pakistan, are of the "CANDU 6" design - with power output in the 700 MWe range. A larger design marketed by AECL is the ACR-1000, in the 1100 MWe range. 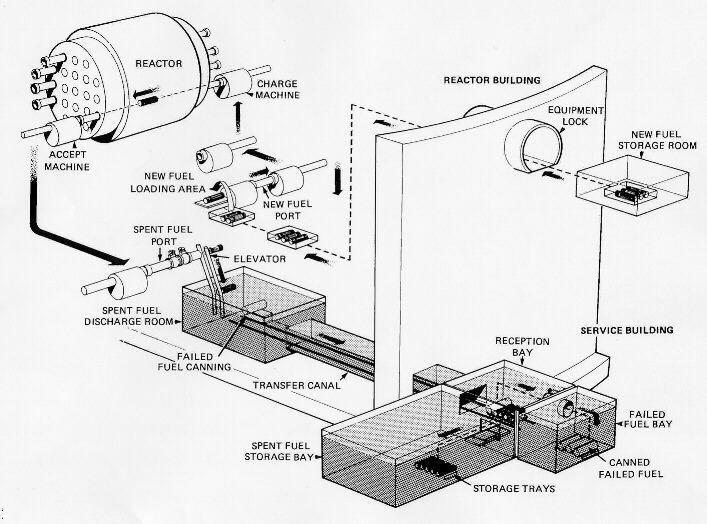 The ACR-1000 ("Advanced CANDU Reactor") was the next generation CANDU reactor developed by AECL (see related faq). The ACR concept retained the fundamental features of CANDU design, while optimizing others to achieve higher efficiency and lower capital cost. No ACR class CANDU reactors have been built. CANDU performance ratings (percentage of production against rated capacity) have traditionally led all other designs, primarily due to the on-line refuelling capability. In recent years PWR performance has improved, while some older CANDU units have suffered extended outages for projects like pressure-tube replacement. Today the average lifetime performance rating of the world-wide CANDU fleet is comparable to its nearest competitors (PWRs and BWRs), and over 10 points higher if one considers only the commercial CANDU 6 units that actually compete against PWR's in the market for new capacity. The following table compares lifetime performance as of September 2004 for the six main reactor types, and one "other" category that includes units like the Indian CANDU-derivatives (the two bona fide Indian CANDU units are included in the CANDU category). Many thanks to Morgan Brown of AECL for supplying the numbers from which these averages were calculated, which he culled from the pages of Nuclear Engineering International, with added data from Nucleonics Week. using on-power refuelling for long-term reactivity management. This means that there is no need to stock the core with enough excess reactivity to last a year or so without refuelling, as in other reactor designs, which also removes the need to add burnable poison to the core to suppress this reactivity early in the core's life. Its high neutron economy allows the CANDU design to potentially utilize a variety of different fuel cycles, including MOX and Th/U233 cycles (the latter, in one particular manifestation, achieving "near-breeder" status). CANDU reactors can also burn spent PWR fuel, since the U-235 content in this fuel is still slightly enriched over natural fuel (a process called DUPIC, or "Direct Use of PWR fuel in CANDU"). The South Koreans are especially interested in this potential synergism between PWR and CANDU reactors, since they operate both types. Recently, CANDU technology has been considered by the U.S. D.O.E. as a vehicle for denaturing weapons-grade plutonium declared surplus after the warming of the Cold War. See the next section for more details. Another interesting fuel cycle option is the use of Recovered Uranium, which is a natural byproduct of LWR reprocessing. Recovered Uranium is about 0.9% enriched, and thus falls within the broader category of SEU (Slightly-Enriched Uranium - 0.9% to 1.2%) fuel cycles being considered for CANDU usage. CANDU reactors may also play a role in fuel waste management, by being able to burn actinides without creating more actinides. In this strategy, waste actinides would be mixed within an inert matrix and burned in a CANDU core. As an efficient destoyer of waste actinides using currently-available technology, CANDU reactors can serve a role in reducing the total volume of high-level nuclear waste requiring long-term storage. Within an international strategy of nuclear fuel cycle centralization (currently a subject of global discussion), CANDU could reduce the total requirement for fast spectrum reactors needed for the final destruction process, while extending the time requirement for their development. "The Evolution of CANDU Fuel Cycles and Their Potential Contribution to World Peace", by the J.J. Whitlock (2000). 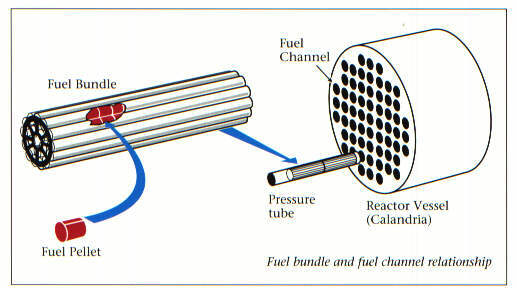 "CANDU Advanced Fuels and Fuel Cycles", by P.G. Boczar et al (2002). CANFLEX (CANDU Flexible Fuelling) is an advanced fuel design developed by AECL since the mid-1980s. CANFLEX is similar in many ways to existing CANDU fuel, but incorporates several key modifications that improve the performance of the fuel. The CANFLEX bundle has 43 fuel pins instead of 37, and utilizes two different pin diameters. This reduces the power rating of the hottest pins in the bundles, for the same total bundle power output. Also, the CANFLEX design incorporates special geometry modifications that enhance the heat transfer between the fuel and surrounding coolant. The use of CANFLEX fuel allows utilities to operate their CANDU reactors more efficiently, especially as they age. Point Lepreau recently participated in a co-operative program with AECL to test CANFLEX fuel under operational reactor conditions. 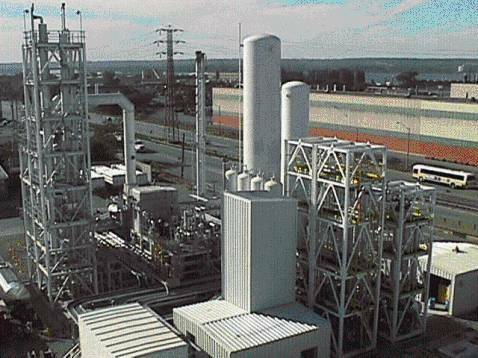 Over a two-year period ending in August 2000, the Point Lepreau station derived energy from a total of 24 CANFLEX bundles (about 0.5% of a core load), as part of a programme to demonstrate viability of the concept in a working reactor. CANFLEX is also the "carrier" of choice for introducing advanced fuel cycles into CANDU reactors (see related FAQ). Bringing a new fuel design to the point of "in situ" testing is not a trivial process. The CANFLEX design has gone through a three-stage review and approval process, and was formally reviewed by a panel of industry experts. This was followed by a detailed review by utility staff, and a final review and approval from the Canadian Nuclear Safety Commission (CNSC, formerly known as the Atomic Energy Control Board, or AECB). Bruce Power, a private nuclear operator (see related FAQ) operating the Bruce Nuclear plant on Lake Huron in Ontario, has recently announced a conversion to CANFLEX fuel at the Bruce plant, by 2006.
flexible fuelling options that allow a range of enrichments and fissile material. It was expected that the capital cost of constructing these plants will be reduced by up to 40% compared to current plants. No ACR class CANDU reactors were advanced to the commercial build stage. J.M. Hopwood, "The Next Generation of CANDU Technologies: Profiling the Potential for Hydrogen Fuel", AECL publication available for download in PDF format (506 kb). J.M. Hopwood, J.W. Love, D.J. Wren, "The Next Generation of CANDU: Reactor Design to Meet Future Energy Markets", Canadian Nuclear Society Bulletin, Vol. 22, No. 3, October 2001. ACR-1000 information webpage on AECL website. 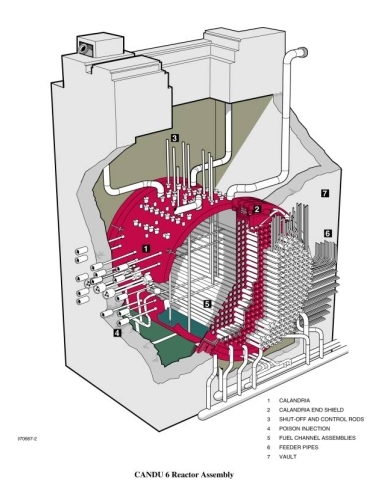 The Enhanced CANDU 6 (EC6) design is a 740 MWe CANDU 6 reactor with improvements to construction techniques (including modular, open-top assembly), operations, and safety, which reduce the cost and increase the efficiency of the proven CANDU 6 product. The EC6 project schedule is planned for 54 months from first-concrete to in-service, utilizing advanced project management and construction techniques that were perfected in previous projects such as the twin CANDU-6 installation at Qinshan, China. The projected life of an EC6 plant is 50 years, with one mid-life refurbishment of fuel channels (a feature of the CANDU design that increases reliability and minimizes the impact of generic reactor aging issues faced by all reactor designs - see related FAQ). The design capacity factor of EC6 is 90% or more. Safety improvements in EC6 include additional heat sinks and a redesigned cooling system to further enhance control of containment temperature and pressure. The number of containment penetrations (wiring and piping, entrances and exits) is also reduced, and the containment structure strengthened to meet a higher design pressure and extend protection against external events (e.g. aircraft impact). Contact SNC Lavalin - Candu for more information. Enhanced CANDU 6 information page, on AECL website. CANDU reactors are controlled by two independent digital computers, both monitoring plant status continuously but only one in control at any time (the other as backup). Reactor shutdown occurs by two independent, fast-acting systems: Shutdown System 1 (SDS 1) consists of cadmium rods (28 in the CANDU-6 design) that drop by gravity into the core; Shutdown System 2 (SDS 2), in most CANDU designs, works by high-pressure injection of a liquid poison (gadolinium nitrate) into the low-pressure moderator. Each shutdown system is independently capable of shutting down the reactor safely, based on trip signals received through independent triplicated-logic detector systems. 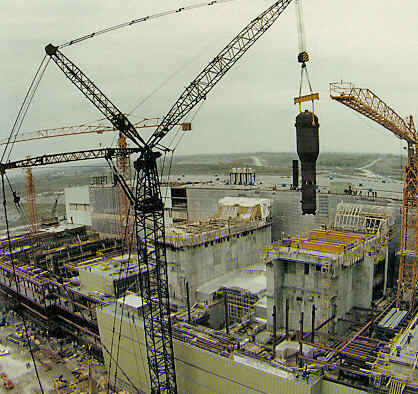 See related FAQ on CANDU safety systems in Section D.
In CANDU reactors built to date (e.g. CANDU 6), fine adjustments to the power distribution, as well as bulk reactivity control, are effected by a set of Liquid Zone Controllers. These are controllable light-water-filled compartments (14 in CANDU-6) located one per spatial "zone" of the core. Each controller is associated with two self-powered in-core flux detectors (28 in total for CANDU-6) responsible for characterizing the average flux in their associated zone. Absolute power levels are obtained by calibrating these signals against thermal measurements. In the CANDU-ACR design (see related FAQ) these fine adjustements are effected with mechanical zone controllers. Long-term reactivity control and flux shaping are effected with fuel-management, since CANDU reactors can be refuelled on-line. In some CANDU designs flux-shaping is also possible with a set of Adjuster Rods (21 in CANDU-6), made of stainless steel or cobalt (this is how commercial cobalt-60 is manufactured in some Canadian CANDU units). Another purpose of these Adjuster Rods is to extend the range of the regulating system in the positive direction (beyond that available from the liquid zone controllers). Extension of the range in the negative direction is provided by Mechanical Control Absorbers (four in CANDU-6), physically similar to the shutoff rods but not associated with the safety systems. These rods are used for rapid reduction in core power, at a rate or range unachievable with the liquid zone controllers. In most CANDU designs, detailed flux-mapping throughout the core is achieved with a highly-distributed array of self-powered vanadium detectors (102 in CANDU-6). The mapping software uses this feedback, along with a database of known harmonics of possible CANDU flux shapes (normal and abnormal), to build up a three-dimensional picture of the neutron flux everywhere in the core. This information is used to continuously calibrate the zone control detectors, as well as provide empirical feedback to the fuel-management software. Moderator poisons are not used for long-term reactivity control in CANDU reactors. Boron is used during initial fresh-fuel conditions (along with some depleted uranium fuel bundles for flux flattening). Gadolinium is used for xenon compensation following long shutdowns. Both these poisons are part of the moderator chemical control system, which is independent of the high-pressure nozzle injection system used for Shutdown System 2. CANDU reactors, like automobiles, are designed to have major components replaced during their lifespan. From the first prototype (NPD, 1962) to the latest CANDU 6, CANDU 9, and CANDU ACR designs, removal and replacement of pressure tubes, calandria tubes, feeder tubes, and other primary system "plumbing" has been an important part of plant life management. The primary reason for this is the limited life of these components under the harsh conditions of reactor operation. Zirconium alloy pressure tubes, in particular, are bombarded intensely by neutrons under immense heat and pressure. Although the zirconium alloy is a robust material, chosen for its survivability under these very conditions, it does experience life-shortening metallurgical changes (e.g. 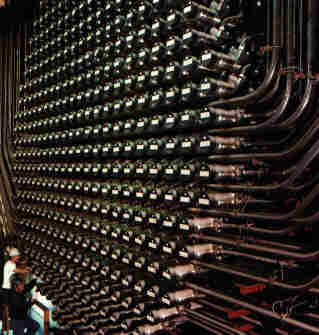 pressure tubes grow several inches during their time in the reactor, and at the same time become more brittle). The monitoring of this situation is an on-going process throughout the reactor's life, and at any time a given pressure tube can be removed for inspection and replacement. The Pt. Lepreau station in New Brunswick recently underwent similar refurbishment saw its useful lifetime extended by another 25 to 30 years. When operating Pt. Lepreau supplies one-third of the electricity demand in New Brunswick. In the case of Pt. Lepreau, the refurbishment included all pressure and calandria tubes, end-fittings. In October 2005 Bruce Power announced the refurbishment of its four-unit Bruce-A station, starting with a return-to-service project involving Units 1 and 2 that will give them 25 years of operating life. This will be followed by a life-extension refurbishment of Units 3 and 4. (See also this related FAQ.) The refurbishment of Bruce Units 1 and 2 was completed in November 2012. In June 2006 AECL announced the refurbishment of South Korea's Wolsong-1 CANDU plant. The refurbishment was completed in July 2012, adding another 30 years to the life of the plant. In November 2007 AECL announced pre-project activity leading to a refurbishment plan for the Embalse CANDU plant in Argentina. Contracts were signed with SNC Candu Energy in 2011, and this work is currently underway. In December 2015 Bruce Power and Ontario's Independent Electricity System Operator (IESO) agreed on long-term sales of 6300 MWe from Bruce, enabling a major refurbishment programme to extend operating lives of Bruce units 3-8 by up to 35 years. From 2016 Bruce Power will receive C$65.73/MWh for all output, adjusted according to consumer price index. The six reactor refurbishments are expected to cost C$8 billion (in 2014 C$) from 2020 to 2033 and include steam generator and calandria tube replacement. In addition, C$5 billion will be spent on other life-extension or 'asset management' work from 2016 to 2053, $2.3 billion of these sums before 2020. The refurbishment schedule is: Unit 6: January 2020 for 48 months; Unit 3: January 2022 for 54 months; Unit 4: January 2025 for 36 months; Unit 5: July 2026 for 36 months; Unit 7: July 2028 for 36 months; and Unit 8: July 2030 for 36 months. Bruce Power has contracted with BWXT Canada to design and manufacture 32 replacement steam generators for the Bruce B plant, for C$ 400-500 million. Bruce Power will continue to provide approximately one-third of its output (2,400 MW) as flexible generation, allowing the province to permanently balance system needs in its post-coal environment. This is a feature that only the Bruce Power units can provide, and has been used frequently by the IESO since 2009. Ontario Power Generation (OPG) plans to refurbish its four-unit Darlington station, beginning in 2016 and extending the life of each unit by another 30 years. The project is scheduled for completion in 2026, with a total cost of $12.8 billion. OPG reports that Darlington refurbishment will contribute $15 billion to Ontario�s gross domestic product (GDP) throughout the project and create up to 11,800 jobs annually. The refurbishment of all four units is expected to involve about 30 million hours of work over 10 years and will support Ontario�s globally recognized CANDU nuclear supply chain, with more than 180 companies employing thousands of highly skilled workers. "Load following" refers to the ability to change the output of a power plant to meet the fluctuating demands of the grid. Traditionally nuclear power reactors in Canada, like large-scale hydroelectric plants, have been run in "baseload" mode (continuous full-power) to take advantage of their relatively low fuelling cost and low emissions. The ability to load-follow has become an important requirement of the electricity market however. All CANDU reactors have the ability to load-follow to a minor extent since they can operate in automatic, "reactor-following-turbine" mode, whereby reactor output varies by as much as 2.5% of full power as grid conditions change. This mode enhances stability of the electricity grid. In addition, both new-build CANDU designs, Enhanced CANDU 6 (EC6) and ACR-1000, are capable of deep, planned load-following. For EC6 this means an ability to cycle down to 60% full power and back (or 50% full power by bypassing excess steam directly to the condensers). For ACR-1000 this means an ability to cycle down to 75% and back (or 50%, using condenser bypass). The CANDU design is well-suited to load following since on-line refuelling allows such operational flexibility at any time during operations (rather than at certain times in the fuel cycle), while also allowing the immediate removal, without disruption, of any defective fuel that may appear. The load-following operation would also be performed completely under automatic control of the reactor, steam generator and turbine-generator.